Prototyping is a charismatic figure: no sooner does one have it in mind than one begins to see it at work everywhere. This is testimony to the astuteness of the organizers’ vision, and the reflexive twist of Chris’s call to prototype ‘prototyping’ invites us to explore the ‘prototyping moment’ that is seized in their vision. I start from a specific theory of prototyping; namely, the classical patent law doctrine of ‘reduction to practice’. Legal doctrine offers a somewhat dusty, parochial, and involuted take on prototyping, but it nonetheless develops the rare thing that is a sustained and evolved discourse on prototyping. Doctrine is not ‘theory’ in the sense that critical scholars might understand it, but that fact is itself salient to any reflection on our ‘prototyping moment’. As I observe in my paper, the nineteenth-century theory of reduction to practice focused on the agency of the things or media to which it ascribed a prototyping function: ideas as they were held in the head, sketches, drawings and blueprints, scale models, and experimental manufactures. 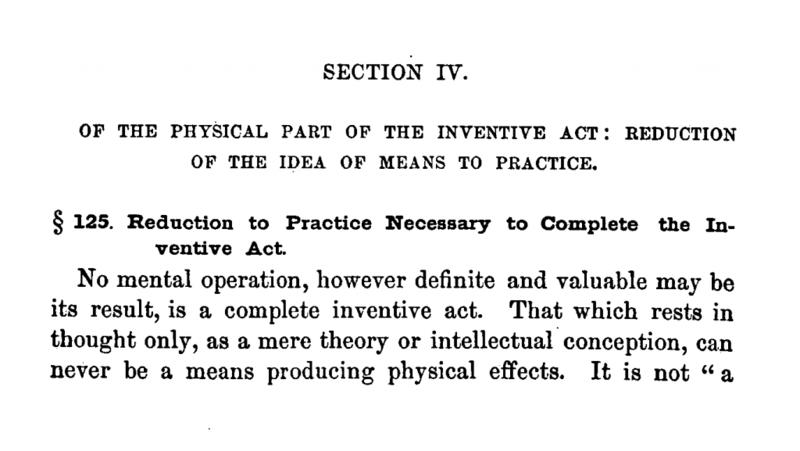 The basic question in the cases was whether an inventor had used one of these material prototypes as a means of perfecting an inventive idea or, alternatively, as a means of materializing that idea as an effective instrumentality. In other words, was prototyping the final phase of experimentation with an ‘idea’, or as the beginning of the process of preparing a finished idea for manufacture? Depending on the answer to that question, the invention would be deemed to have been either complete or still in process. As I suggest in my paper, the legal topos of ‘prototyping’ negotiated the equivocations between tangibility and intangibility, between recollection and anticipation (prototypes were material anticipations of the future, material forms that recursively folded a recollection (design) into a future manufacture), and between legal schematizations and the reality that they schematized. So, what does this have to do with our ‘prototyping moment’? Abstracting from the specifics of 19th-century doctrinal theory, the interesting thing about law’s prototyping of prototypes is that it turned a noun into a verb, dissolved materiality into sociality, and, crucially, reconstituted material instruments as means of ‘de-instrumentalizing’ the social process of bringing machines into being. In the scene of a legal dispute, the form of the prototype was rematerialized as a non-instrumental translator or agencement, or as an unmotivated operator that could be used strategically, to reorganize or reinvent linearity, materiality, and collectivity. In a crude sense, this mode of agencement is still in play in contemporary (theoretical) debates about prototyping in complex (informatic) settings: crudely, prototyping is what happens when the distinction between means and ends folds into itself, so that what is means and what is end becomes an effect of interest or strategy. This gets us to the connection between an antique legal doctrine and the charismatic effect of ‘prototyping’. I have heard people – as it happens, anthropologists – ask the question ‘what comes next [in the theoretical life of the discipline]’? This kind of question performs, or symptomatizes, our prototyping moment. ‘Prototyping’ is an instance of what has already ‘come next’; it is an example of a figure that recollects theoretical operators or motifs, that abstracts them from the motivational impulse of any particular patron (proper noun or architectonic schema) and turns them into a mode of theorization which presuppose that what remains of (now old) theoretical architectures is a repertoire of operators with(in) which one is always beginning again (prototyping). The challenge is to iterate theoretical operators anew, to reinvent them as means of reinventing the worlds that scholarship conjures into being. Figures such as ‘prototyping’, ‘ontology/ies’, or ‘public(s)’ are charismatic because they have something like the function that patent law ascribed to its material prototypes. They selectively recollect a theoretical tradition and (recursively) fold it into a project of conceptual renewal. The point is to absorb theoretical resources that we are supposed to know already into a device that recombines those resources in the same moment as it brings them to bear on the world that is renewed through their agency. In a sense, what comes next is what we have always done. Reflexivity is ingrained as the most basic disposition of the contemporary social scientist: scholarship is almost necessarily a mode of what cyberneticians call ‘second-order observation’; of oneself, or, more usually, another. The point of scholarship is to know, if not better, then otherwise – to reframe, reanimate, enrich, recombine. The recursive form of the call to ‘prototype’ prototyping operationalizes this disposition – so too does my response – and in so doing makes explicit the kind of recollection that is already immanent in ‘prototyping’. The attempt to turn reflexivity into recursivity, to effect what cyberneticians call the ‘re-entry’ of one form into another, or to (re)incorporate ends in means, very nicely frames ‘prototyping’ as a device whose sense and effect are themselves effects of reinvention. And, by doing to prototyping what prototyping does with the worlds it elicits, it reproduces the logic of our prototyping moment. All of this may or may not help us in seizing the prototyping moment, but I, for one, propose to go on being inspired by ‘prototyping’ in the sense that is advanced by the organizers.